Traveling around in Central America, it’s quite often you stumble upon an incredible little “soda” or family-style restaurant, and leave satisfied from some new wonderful typical plate or my favorite appetizer, patacones. Some of the local foods the Costa Ricans or Ticos live on are fresh fish, mango, papaya, yucca, bananas and what’s used in patacones, plantains. When heading out for a typical breakfast you sit down to a plate of classic “Gallo Pinto”, which is sauted rice and beans, cilantro, red pepper and Lizano, eggs how you like, pan fried plantains and fried local cheese called, “cojita.” Ahh, salty and sweet…so satisfying. 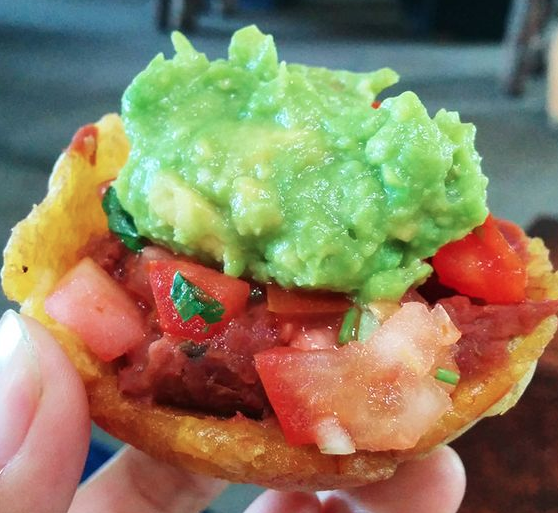 Another way plantains are used are by smashing delicious round slices, frying them up and topping with guacamole and pico de gallo! They make a tasty afternoon delight with an ice cold pink grapefruit margarita. See you at your next stops, sunset at the beach and a hammock. Let’s get the pico de gallo out of the way first, then we will get to the plantains. Start by dicing up the tomatoes, onion, jalapeno and cilantro. Remember to take out the jalapeno seeds so it’s not too spicy or not, if you like an extra kick. Mix the ingredients together in a bowl, add ½ of a lime, salt and pepper. Pico de gallo is ready! Place it in the fridge until the patacones are finished cooking. Now, peel the plantains and slice in rounds, about a ½ inch thick. Begin heating the oil on medium-high heat. When the oil sizzles with a drop of water, add the plantain slices. Cook for 4 minutes on each side or until lightly browned and remove onto a paper towel. On a clean cutting board, smash the plantains with a pot, coffee mug, roller or a wooden spoon also works well. 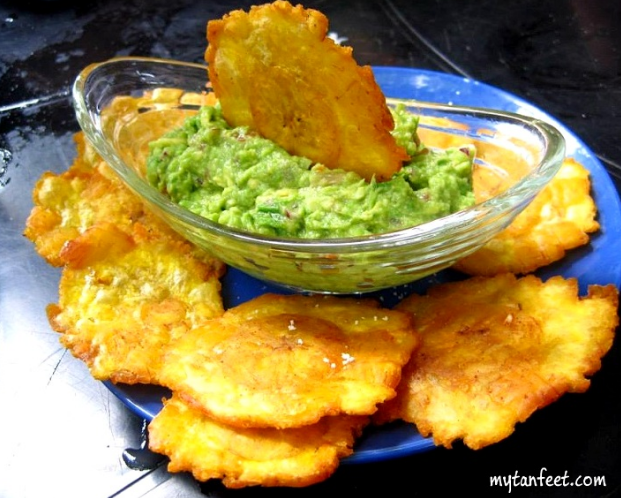 Soak the plantains in water for 1 to 2 minutes and fry them a second time until crispy and perfectly golden brown. Add a little sea salt if you have it. Spoon on a dolop of guacamole and pico de gallo! Perfect patacones! Try adding shredded chicken, bean dip or mango salsa!